In April of last year (2017), the nonprofit that I co-chair, ACE (Asian Cultural Experience of Salinas Chinatown), co-sponsored a Salinas Chinatown Inside Out art project with CSUMB’s Service Learning Dept., headed up by Jeff Lehner. The project worked with the Inside Out organization in France to post “ephemeral” images of people who lived in or owned property in Salinas Chinatown; “ephemeral” because the images were meant to disappear in time. Many of the faces we posted were of the homeless people of the neighborhood, as well as the faces of people whose families had helped to found and build Chinatown since the late 19th century. Inside Out Project, Salinas Chinatown. ACE members Larry Hirahara & Cathy Chavez-Miller in front of Chinatown faces. 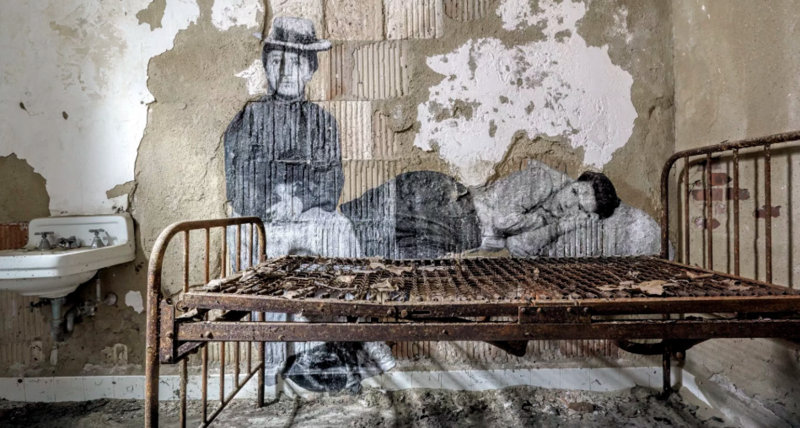 The Inside Out Project is run by an amazing artist, JR, who has given his “paper and glue” process over to the people and provided reproduction services to them; in doing so, the project has brought attention to people and places that have been marginalized. The Project helps to bridge cultures, and create empathy and understanding. Many of these projects (both his own, and those of the neighborhoods who have participated) range from just one wall to monumental, and have a global reach. Perhaps JR’s project gives you some ideas that you can use for your own neighborhood. Go to the Inside Out Project website to see how you can participate, form your own Group Action, and use the Project’s services.